Ask any financial planner about getting out of debt, and you’ll likely get a laundry list of concrete to-dos that you need to do to beat your debt. However, debt really isn’t just about money. There is a psychology to overspending that most people miss to their detriment. Without understanding how and why they got into so much debt, these people are doomed to repeat their patterns of debt. This is true even if they get “back to zero.” Usually, they end up in debt again after a very short time. If you’re one of those people, you probably need a new set of debt tactics, some psychological ones. These will address the underlying cause of your debt. If you’re ready to make some changes to your finances, check out these five psychological tricks to getting out of debt. In his book “Total Money Makeover,” financial expert Dave Ramsey suggests that debtors make sure to get in some small wins early on in their fight against debt. Here’s how you do that. You make a list of your debts and put every extra dollar that you can toward paying off the smallest one as fast as you can, while only paying the minimum amount on all your other debts. You do this even you have other debts with higher interest rates. The principle is more psychological than financial. Ramsey has found that people who pay off some small bills first are more motivated to continue paying off debt when the going gets tough. If you’re deeply in debt, you know without a doubt that conquering your debt will take a long time. You also know that Dave Ramsey suggests getting small wins right up front. But how will you keep inspired after you’ve run out of small wins? One way to do it is to remind yourself of other people who have overcome an enormous amount of debt. Stories about people who’ve overcome debt give you solid ideas about steps you yourself can take. You’ll find out from these stories that people got extra jobs, consolidated their loans, and kept a tight budget. Although you know these debt-relief strategies in principle, it’s different when you read about actual people who’ve employed them. The stories will inspire you and keep you going when you’d rather quit. There is a mindset to debt that keeps you in debt, according to an article on Debt.org. This mindset determines your spending habits, which in turn, determine the amount of debt you have. If you really don’t have any idea about where you spend too much, start your debt-education strategy by keeping a money journal. Write down every purchase you make, whether it’s big or small. Keep the journal for at least a month. You’ll quickly see where your extra expenses are coming from. After you determine where your money is going, make plans to alter your spending habits. For example, let’s say that you’ve figured out that you spend too much on your daily coffee habit. If you spend $4 a day on coffee, five days a week, you’ll have spent almost $100 on coffee by the end of the month. It’s better to buy a bag of your favorite coffee and make it to go. Even if you splurge and buy an $8 bag of gourmet coffee, you’re still spending significantly less on coffee than you would be by going out for it every day. Another challenge you’ll face as you dig yourself out of debt is trying to tackle the problem alone. Aside from the fact that you may not have a real understanding of how to get out of debt, you may crumble without some support. Accountability partners help. These can be your spouse, a friend, or when push comes to shove, a credit counseling agency. A credit counselor will help you set a budget and will often negotiate with your creditors on your behalf. Be forewarned, however, that this process can take several years if you are deep in debt. People who have gotten themselves out of debt have often had to become very clever in the process. They clip every coupon they find. They only shop yard sales. They move out of expensive houses and into tiny apartments to get the job done. It’s like a game for them, and it can be for you, too. And it’s a game that, if you get good at it, will get you out of debt faster, the more you play. Getting out of debt can feel overwhelming, especially if you have an enormous amount of it. Although there are some practical steps you can take to get a handle on your debt, much of debt reduction is actually psychological. 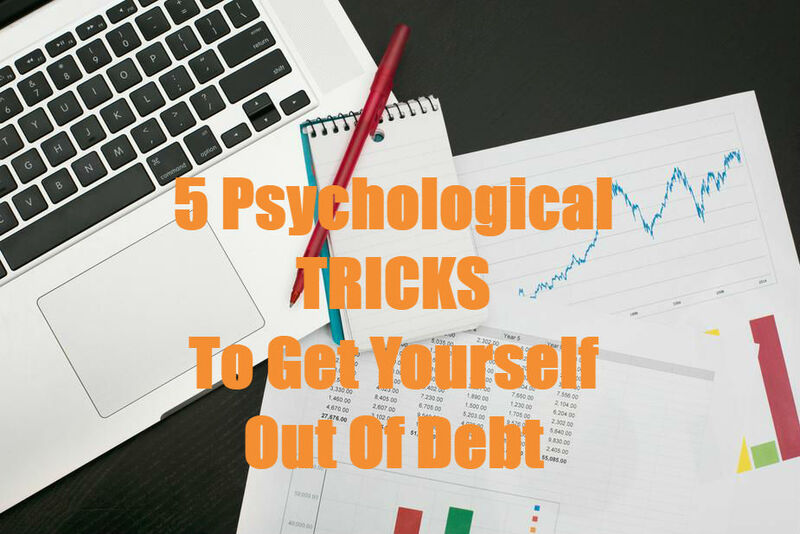 The five psychological tricks in this article are designed to get you motivated and in the right mindset to tackle your debt. If you master them, debt-free living could be your way of life before you know it. This entry was posted in Finance and tagged debt help, get out of debt. Bookmark the permalink.